With its sales continuously on the rise, concentrate is destined to outshine flower in today’s growing cannabis market. Producing faster relief, a better flavor, and an overall higher potency, its high demand should come at no surprise. With the wide selection of various strains and textures, shopping for concentrate can be overwhelming. 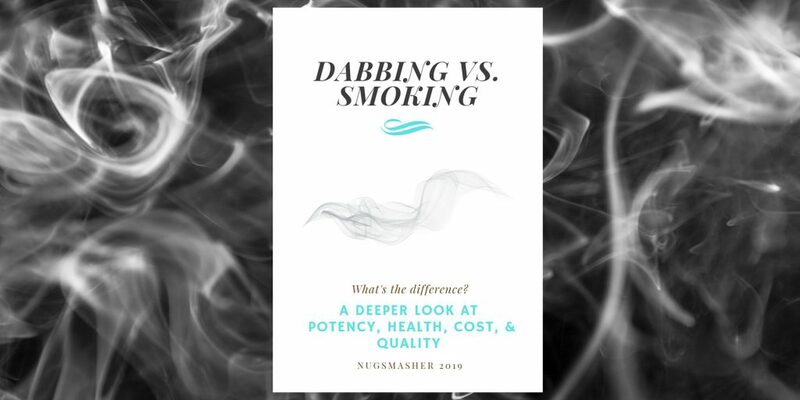 To simplify, all of the available product can be categorized into the two methods of extraction, solvent-based methods vs. solventless methods. Solvent-based extractions are all similar in their method. 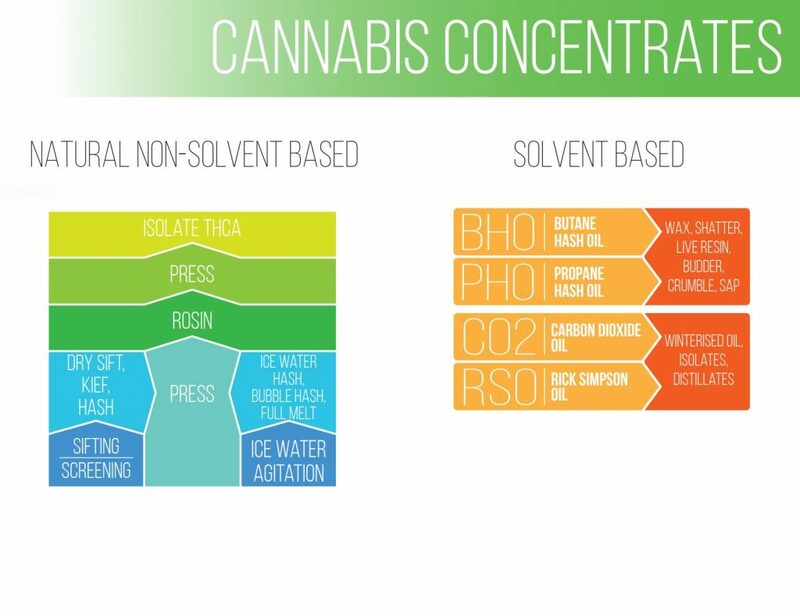 A liquid solvent is first used to separate the desired compounds of the cannabis plant. The resulting solution is a liquid mixture of the two that must be put through a purging process to remove the harmful chemicals. Some of the most common solvent-based concentrates are Butane Hash Oil (BHO), Propane Hash Oil (PHO), C02 Oil (C02), and even Rick Simpson oil (RSO). The BHO and PHO method results in wax, shatter, and live resin budder, crumble, and sap — C02 will result in winterized oil, and isolates. Just a few years ago, the only solventless methods were used to make dry sift, kief, and hash. Today, the rosin method has taken the solventless community by storm. The term rosin refers to both the process as well as the resulting product. Combining both heat and pressure, rosin has opened new doors allowing consumers to enjoy the effects of concentrate without fear of harmful solvents. It may sound enticing to attempt solvent-based extractions at home but because of the extreme safety risks, it is recommended to leave this process in the hands of laboratory professionals. All solvent-based extraction methods are essentially the same in their method. The difference between in-home versus laboratory extraction lies mostly in the quality of the equipment. BHO begins with packing the plant material into an extractor vessel. This is where solvents will pressurize, wash, and extract the desired plant compounds, which are then collected in a liquid form. At this point, the hash maker must put the solvent mixture through a purging process to remove the harmful chemicals. This is usually done by applying heat or using a vacuum method. The level of pressure and temperature in these final steps is what determines the texture of the extract. The final stages of purging can be lengthy, sometimes up to 72 hours or more. Within the past year, every Southern California county has reported at least one BHO in-home lab explosion. These accidents can force houses off their foundation, leave victims with life-impairing injuries, or end fatally. Are these the results of a few knuckleheads or is this method as dangerous as the headlines imply? There are people who have been practicing this method, accident-free for years, but the unfortunate truth still remains that the potential dangers of solvent-based methods lie both in the process as well as the end product. The combination of both heat and butane is a disaster waiting to happen and something as simple as a spark from a light switch can trigger an explosion. In some states, certified lab requirements minimize the safety risks and although they can create relatively solvent-free BHO, residual solvents will always remain. A common misconception is that clarity indicates quality. According to Steep Hill Labs, a glass-like shatter is likely to test higher in solvent ppm (parts per million). A clear shatter may be visually captivating but darker rosin can still be more potent. This is also true amongst textural appearances. 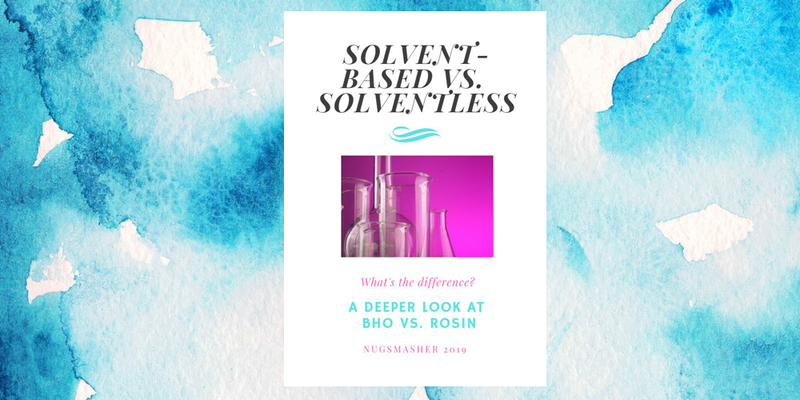 Compared to rosin, solvent-based has a wide variety of textures but the only true way to determine differences in cannabinoid levels is by undergoing lab tests. Some solvent-based enthusiasts prefer that the flower is not physically agitated in its process as opposed to the pressure used with rosin. The claim is that keeping the structure of the flower intact better preserves the terpenes. The rosin community has matured since it’s hair straightener days. There are now a variety of affordable rosin press machines on the market for personal or industrial needs. As technology has advanced the method hasn’t changed much. Quality machines allow for better control, accuracy, and result in a better yield. The rosin technique is fairly straightforward, simple to use, and easy to learn. It combines both heat and pressure without the use of any external solvents to extract the desired compounds from the cannabis plant. If you ask 10 different people their temperature and pressure preferences you should expect to receive 10 different answers. Luckily, with Nugsmasher’s community database, Terpfile you can reference detailed extractions and compare your techniques with other passionate pressers to find the best yields. In our extraction video below, we press 28 grams of flower on the Nugsmasher Touch. After 90 seconds we are left with 7.5 beautiful grams of solvent-free extract. Rosin is a safe and worry-free process that can be done in the comfort of your own home. There is no danger of ingesting toxic chemicals and absolutely no risk of fatal explosions. When not carefully crafted, homemade presses can result in bent frames, or leaking hydraulics. Although risks are rare and nonlife-threatening, it is highly recommended to invest in quality machines. Every Nugsmasher is built by hand and undergoes testing with the strictest tolerance and quality control measures available in the industry. All versions are constructed with the US made structural steel and T6 6061 aluminum and are fabricated and assembled from start to finish in-house at the Nugsmasher factory in Corona, CA. Rosin will contain the same terpene profile as BHO and other solvent-based concentrate but without the chemical solvents altering its taste or quality. When using the rosin technique, factors such as temperature, time, and pressure should be closely monitored but the most important factor in producing quality is making sure you begin with… quality! Clarity, yield, and effect depend on factors such as terpene profile, trichome density, material density, and active cannabinoid content of the starting product. Rosin enthusiasts will say that the consumer reaps the benefits of “whole flower” extraction because it better preserves the intended effect of the particular strain than in comparison to solvent-based methods. When it comes down to it, BHO and rosin both test approximately 60% – 90% THC levels. The professional BHO labs can minimize safety risk, and reduce residual solvents to a relatively harmless rate and while the average consumer may not pay mind to the smallest residual solvents, it may be more beneficial over time to consume extract that is guaranteed solventless. Some BHO laboratory extractors can process anywhere from 5 to 40 pounds of flower per run but the necessary purging process can set the process back for days at a time. On the other hand, rosin’s overwhelming appeal stems from how quick, safe, and easy it is. Overall, BHO and rosin are similar in their THC levels and effect, but the guarantee of solvent-free extract, the ease, and low-risk nature of rosin makes it the superior choice.